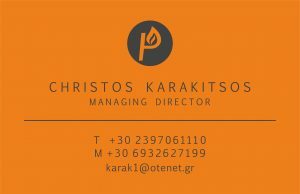 The company Christos Karakitsos is located in Stavros, Thessaloniki, in the northern part of Greece and has been operating since 1970. It has started the production of vegetable charcoal for barbecues and in recent years it has also imported South American vegetable carbon and sawdust briquettes from Malaysia. Our products are world-famous for their quality. They have a constant burning, odorless, environmentally friendly, with very little ash residue. Because of all these advantages, our products are among the most competitive in the market. Our company employs 15 employees, who daily monitor our clients according to their needs, through the best application, experience and knowledge. Our company, apart from its headquarters in Stavros, has 2 other facilities in Pylea and Aspropyrgos, near Athens, therefore it can meet the expectations of all customers from the North to the South of Greece very quickly, offers the most competitive prices. The packaging and delivery of our products takes place after consultations with our customers within 5 days. The main purpose of our business is to offer our customers the best products at the most competitive market prices.